Lisa Jackson is the Vice President of Environmental Initiatives at Apple. She was the Former Head of the US Environmental Protection Agency (EPA) under President Obama. Apple creates Apple designs and the iPhone, iPad, Mac notebooks and desktop computers. EPA is a Federal agency that is committed to protecting the natural environment. She works as an Environmental Engineer today at Apple. Lisa wanted to become an Engineer because she was good at math and science. Before she went to college, she thought she wanted to go to Medical School to become a Doctor. But the summer before college, Tulane University had a 6-week program of hands-on Engineering. Lisa fell in love with Engineering and got a BS in Chemical Engineering from Tulane University. Then, she attended Princeton and received a MS in Chemical Engineering. She took classes in electrical engineering, computers , thermodynamics, high level math, music, art and other science. Lisa went to work for governor of New Jersey to run the state's EPA. 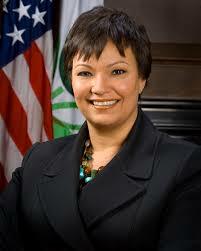 In 2008, President Obama officially designated Lisa as the nominee for Administrator of the USEPA. At USEPA, she successfully pushed for tougher fuel economy standards. She wanted all cars to have an average of 55 miles per gallon by 2025. This is important because exhaust from cars helps cause climate change and contains deadly toxins. She went to Apple in 2013. At Apple, Lisa oversees all of Apple's environmental and sustainability issues. The best part about her job as an engineer is working with others and learning something new every day. Lisa gets to be creative through her engineering field. She likes to use engineering to help the earth. Engineers get to translate math and science into solving problems in the real world. It provides a great foundation for any job, even if you are not sure of what you want to study.